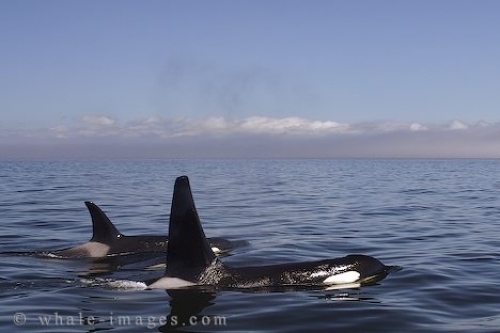 A male and a female Orca Whale traveling together in Queen Charlotte Sound in British Columbia. This Picture of two orcas shows the clear difference between a female orca and a Male Orca. The Dorsal Fin of a male Orca Whale is much larger then the one of a female Orca. A male Killer Whale Dorsal Fin can be up to 6 feet high, while the female orca dorsal Fin may reaches height of up to 3 feet. This image shows the difference nicely. This photo of two orcas traveling together was photographed in Queen Charlotte Sound off the Northern Vancouver Island coast from a whale watching boat. Picture of two Orcas swimming together in Queen Charlotte Sound off Northern Vancouver Island in British Columbia, Canada.